In this tutorial, you will learn how to migrate your website from Blogger to WordPress, setup a redirection from your old website to your new WordPress installation and keep your traffic. Login to Blogger and access your blog Admin Area. Make sure you choose the blog you wish to migrate (if you have multiple blogs). 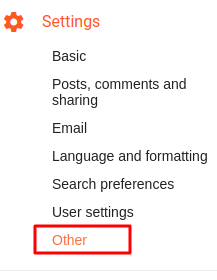 Go to your blog Settings menu and click Other. 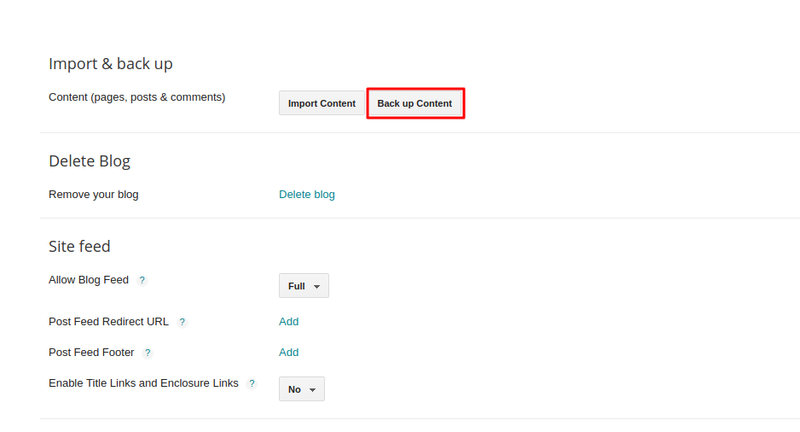 In the Other menu, choose to backup your Blogger website by clicking Back Up Content. You will download a .xml file. Make sure to keep that file close. Now access your WordPress Admin Area. In the Admin Area, on your Dashboard, access the Tools menu and select Import. You will need to install the website importer of your choice. In this case you will need to choose the Blogger importer. Just click Install Now near the Blogger importer. Once installed, the option will change from Install Now to Run Importer. Click Run Importer. A new menu will appear. Click Choose File and select the .xml file you’ve downloaded from your Blogger website. After that just click Upload file and import and you are done importing your website from Blogger to WordPress! Right now, you’ve transferred all of your users, posts, comments from your Blogger website to WordPress. However, all your traffic will still go to your Blogger website. A solution to this would be to setup a redirection from your old website to your new one. There are a few different ways on how to setup a redirection from your Blogger website to WordPress. The easiest and least time-consuming method would be to use a plugin. There are quite a few plugins that can help you in this case. This plugin is a great example. Download and install the plugin. 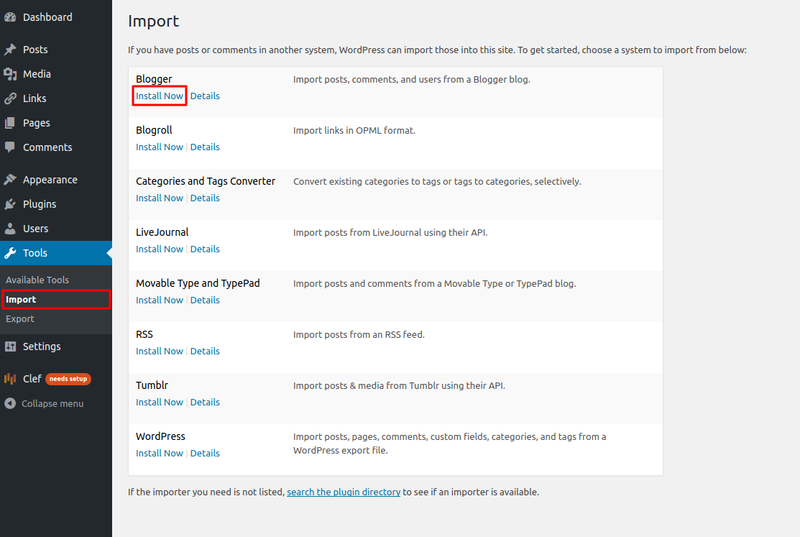 If you have any difficulties installing the plugin, you can refer to our guide on how to install WordPress plugins. Go to your Tools menu on your WordPress Admin Area Dashboard and select the Blogger To WordPress Redirection plugin. In the plugins menu just click Start Configuration. The plugin will let you choose the domain of your blog (as you can migrate multiple Blogger websites to your WordPress) Click Get Code and you will receive a template code for your Blogger website. Access your Blogger website and go to the Admin Area. 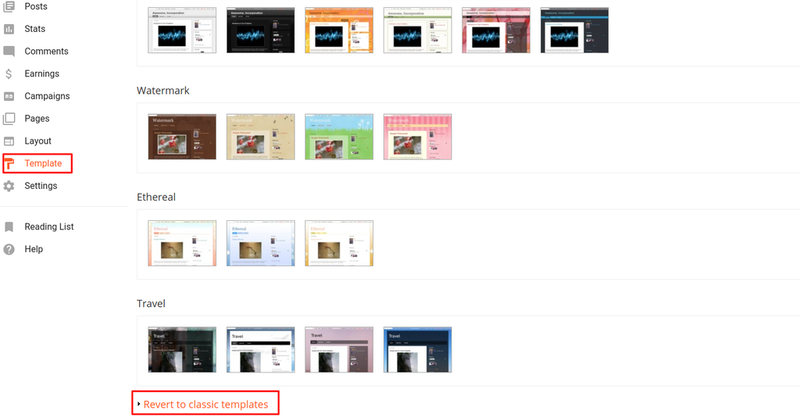 Navigate to the Template menu and at the bottom of the page click Revert to classic templates. The template menu will change and you will be able to edit the template HTML code. 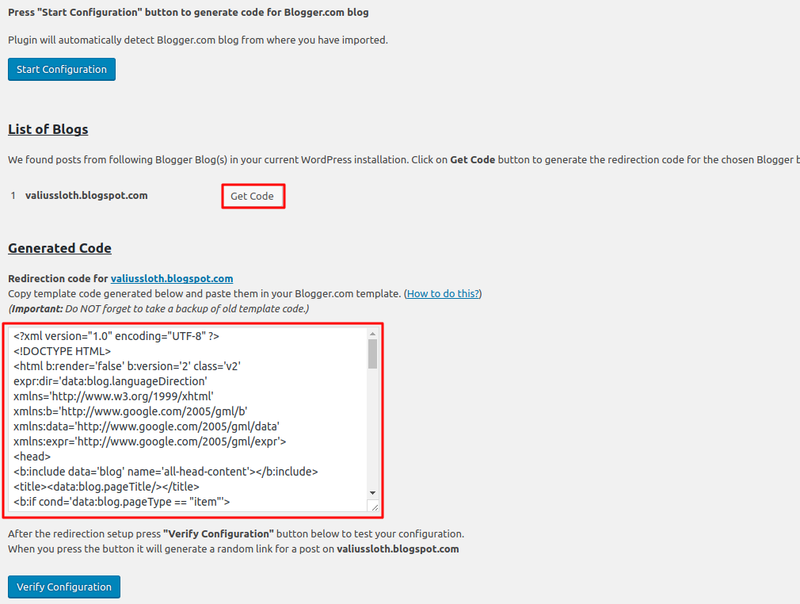 Copy the generated code from your plugin and replace the code of your Blogger Template HTML code. Click Save template and you are done! You can test if the redirection is successful by clicking Verify Configuration in your plugin menu. The plugin will provide a link to your Blogger website. Click the link and you should see your new WordPress website rather than your old Blogger.